A discontented post-War generation diagnoses youth to be their sickness and do their best to destroy it. Bourgeois existence or suicide, there are no other choices! Pitiless and bored, seven sexually entangled medical students start a dangerous game – will they be strong enough not only to survive, but to win the game? This is the main plot of the play written by Ferdinand Bruckner entitled Pain is Youth. The play was staged by successful young director Data Tavadze at Tbilisi Royal District Theatre that enjoyed remarkable applause from the audience. Data told The Messenger that the play was a great challenge for him and his group, as it concerned universal topics and should have been close to the Georgian youth perception as well. How successful was the premiere? It is quite hard to speak about your work. However, I believe that the premiere was fruitful. I do not use the word to diminish the value, I use the right word that perfectly illustrates what I want to express. The play was full of discoveries for the whole company. We have checked many things in ourselves and in the viewers. Such a high interest of audience towards such a specific play was essential for us. What category of viewers attended the play mainly? Generally young people attend our plays. A young person can see himself, his attitudes and desires better in a young actor, this is some kind of dialogue between the same age people. This play reveals problems related to the young people, their hardships and thoughts. Thus, it is more understandable for the youth. We also use modern speaking language and music in our plays. This facilitates communication with the young generation. Why did you show interest towards a particular piece? There are many reasons for that. Firstly, it is one of the most interesting and hardly explainable plays I have ever read. The play has fascinating characters– and that is what encouraged me the most to stage it. I think that such characters have never been revealed on Georgian stages. 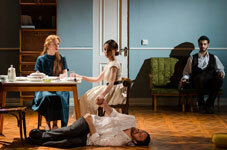 How can the reality described in the play be understandable for the Georgian audience? Situations illustrated in the play are easily understandable for Georgians. The play concerns universal issues. It is about human relations, relationships between the young people who are in crisis. The play describes the post-war situation. Georgians had gone through such developments. The play describes the situation after World War I until Hitler takes office. The period looks like Georgia of the 1990s, when people had no choice, when everything was destroyed, this is a period of the lost generation. The current Georgian youth can think about themselves, about their wishes and intentions. However, in the 90s people could think only how to escape the depression. Even those who are middle-aged and old people who were young during the 90s are dying now owing to the terrible fear of the war situation. I will never forget one phrase. This phrase follows me. I saw a moment when a man who was participating in the Abkhazian war, was trying to commit suicide. He was repeating the phrase prior to the action – “war in Abkhazia is not completed yet as its soldiers are dying now.” It was a very inspiring phrase for me while working on the play. I will never forgive any Georgian government that they did not care about the bringing people out from such depressions through planned, sensible methods by means of psychological assistance. That’s why the people could not escape from the war emotions. The play is about the students who should become doctors in the future. However, it is a post-war period and the Vienna Institute is used as a hospital. During this time, even the students of the first form had to make the hardest operations, when they had no knowledge and practical skills. Consequently, they killed many people due to their unprofessionalism… they were under the heaviest responsibility. The situation is quite similar to our August war in 2008, when our reservists did not even know how to hold weapons… they were taken to the war without any experience…The government hysteria affects the young generation mostly, as war concerns the young mainly. What can a young man learn from the play? I know that you wanted to stage the play long before, why did you fail to do it earlier? Yes, I had wanted to stage it for 8 years. The reason is that I was not quite young then…I am happy that I made the play now, as I could not have done it last year or before. It was the right time for me. I have gained much experience and emotions recently in my private life and from other people and situations. The negative mood that is dominating in Georgia at present created a crowning moment for staging the play. Too much negative emotions are accumulated among the public now owing to unemployment, less chance of self-expression and so on, and the negative mood is revealed through the ugliest forms unfortunately.